We live in a society that places a lot of emphasis on beauty. In the media, we’re shown images of bodies that are far from realistic. Unconsciously, we tend to want to emulate these stereotypes that have been turned into beauty standards. As children and teens, we’re regularly exposed to these unrealistic standards, which can have an impact on our self-esteem and our eating habits. A word of caution, though: it’s easy to blame society for eating disorders, but beauty standards aren’t the only reason they surface. They’re complex problems that depend on a number of factors. When a child or loved one develops an eating disorder, it can be hard to know what to do. 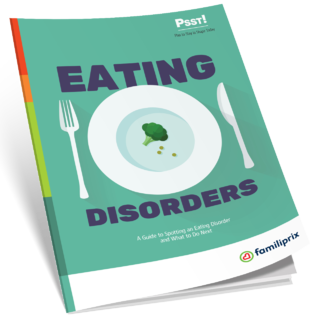 This guide has been developed to help you support the people around you who may have eating disorders. Reading it will help you understand the issues involved so that you can talk about them!